GENEVE, March 27, 2018 /Christian Newswire/ -- Members and partners of the World Council of Churches Ecumenical Water Network (WCC-EWN) at the Alternative World Water Forum (Forum Alternativo Mundial da Agua or FAMA, in Portuguese) ratified the "Ecumenical declaration on water as a human right and a public good," originally released 13 years ago. Promoted by several local and international civil society organizations, FAMA was a parallel event to the official World Water Forum, in Brasilia, Brazil, 18-23 March 2018. The rededication of the ecumenical water declaration took place at the interfaith tent during a worship service at FAMA on 23 March. The declaration had been first issued on 22 April 2005 by the National Council of Churches of Brazil (CONIC), Swiss Confederation of Reformed Churches, National Conference of Bishops of Brazil (CNBB) and the Conference of Bishops of Switzerland, during a joint meeting in Fribourg, Switzerland. Dinesh Suna, coordinator of WCC-EWN, said, the declaration is still relevant to our present context because the demand to recognize water as a human right and is even more urgent today. "There are 2.1 billion people without access to safe drinking water today - double what it was in 2005," he said. WCC is inviting its member churches to commit to water justice by endorsing the water declaration. 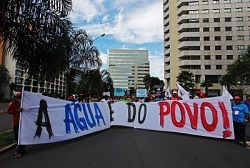 On 22 March, World Water Day, at the closing FAMA event, the interfaith group led a march for water justice followed by a prayer service representing several leaders from different faith communities and indigenous people. The World Council of Churches promotes Christian unity in faith, witness and service for a just and peaceful world. An ecumenical fellowship of churches founded in 1948, today the WCC brings together 348 Protestant, Orthodox, Anglican and other churches representing more than 550 million Christians in over 120 countries and works cooperatively with the Roman Catholic Church. The WCC general secretary is the Rev. Dr Olav Fykse Tveit, from the [Lutheran] Church of Norway.